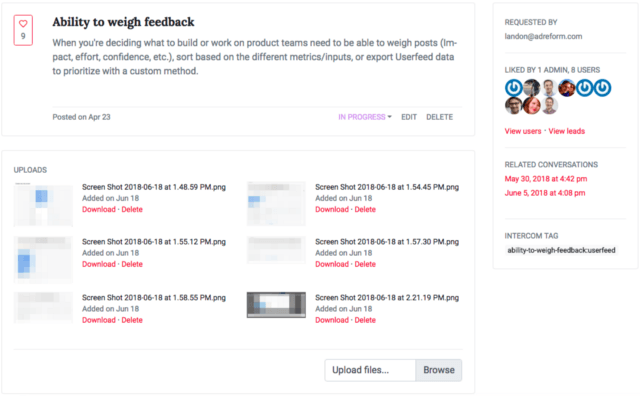 This weekend one of our users mentioned us on IndieHackers as a great product for managing product feedback. Someone immediately fired back. She said that you shouldn’t let your users dictate your product development, that you need to own the vision of your product, and that feature request forums cause you to build a “hodge podge” product with no general direction. She's mostly right, so I wanted to highlight some of these issues and how we’re tackling them. Customer conversations within something like Intercom tend to begin with problem statements (How do I, do you support X, I’m having a challenge with X), which offer you much higher quality feedback when you dig deep enough. With Userfeed, feedback is linked to Intercom, allowing you to identify the problem statements within the context of actual conversations. Usually only 5% of users will be active in a forum like this. You’re missing out on lots of feedback that your customer-facing teams are getting on a daily basis. With Userfeed, you can log feedback within conversations from all of your users you’re engaging with. All you see is a title and description (maybe some other comments from users if you’re lucky). Understanding the why is much more important than the feature request itself. When you can link customer conversations to a feature request, you give your product team the context they need to build the best solution. With Userfeed, all related Intercom users and conversations are attached to a feature request (with one-click to view in Intercom), as well as internal conversations, giving you full context. What if they’re not users? What if they’re free users? What’s the total revenue value associated with those users? Are those users from one big account or a bunch of accounts? What’s the average user engagement coming from these accounts? Not all feedback is equal, and your feedback tool needs to account for this. With Userfeed, feedback is segmented by Intercom users and leads (leads aren’t users of your product). Because we sync all associated Intercom data, you’re one click away from segmenting users by revenue, account, and other attributes you track in Intercom. Not a great user experience, and no one wants users leaving their app if they can help it. You might be able to embed it within your app somewhere, but that requires dev work. 😢😢 Why do I need to log into something else? 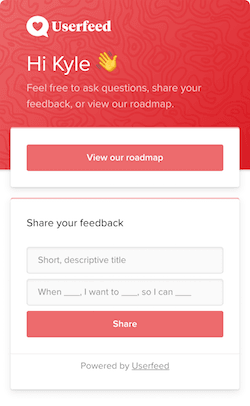 Userfeed allows your users to submit feedback and view your roadmap via an Intercom messenger app. Your users don’t need to leave your app and they don’t need to log into some third-party forum. It’s all within the Intercom messenger. Legacy forums often have outdated designs that depart from your site’s experience. With Userfeed, we’re within the Intercom Messenger experience, which allows us to be cohesive with your site and brand. When someone provides feedback, you shouldn’t have to direct them to go log it themselves in another location. With Userfeed, you can submit feedback on behalf of the user directly within an Intercom conversation (using the Intercom Messenger app). This allows you to take the burden off the user (they already gave you feedback so don’t make them do it twice) and seamlessly link the new feature to that user and conversation. We definitely don’t see the collection of user feedback as a substitute for owning your product vision and building strategically. In fact, we see feedback as one piece of the product prioritization puzzle. We started building Userfeed while working on another SaaS product (Ad Reform). Our customers would chat us via Intercom with questions or challenges as they used our product, and we wanted a fast and easy way to organize this feedback as input to our planning process. The Userfeed messenger app makes it simple to submit feedback on behave of a user within a conversation. You can also tag conversations to link the conversation to an existing request in Userfeed. With Userfeed, we can quickly log their feedback and link to the original conversation to maintain the context of the request. Referencing this context can help identify the underlying pains, which we can then use as input to our planning process. We can also reach back out to them to learn more about their problems and goals using Intercom. Users may not be experts at identifying solutions, but their input can help uncover opportunities. We use Userfeed to help us build Userfeed, but we don’t just take the most-liked requests and build them. We’ve seen companies do this in the past and it usually leads to half-baked features and a lack of focus that holds companies back. Gathering feedback from within your app and via customer conversations is where we’re starting. But our vision is to incorporate these other facets of prioritization into the product to simplify this process. Instead of purely letting customers dictate your roadmap, you remain the decision-maker, but you’re now armed with information surfaced from customers to consider alongside your other decision factors.